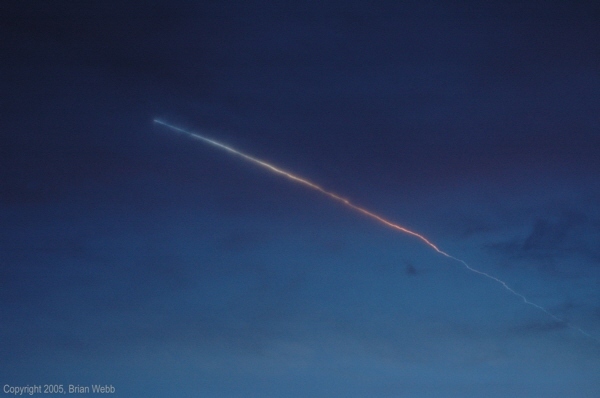 At dusk on 2005 September 22 a Minotaur rocket carrying the Streak satellite was launched from Vandenberg Air Force Base in California. The event created one of the most impressive celestial displays in years for the southwestern U.S. and western Mexico. The following is a selection of the best images and movies of the launch. All images and movies are copyrighted and the property of their respective contributors. The webmaster went to the mountains a few miles north of Santa Barbara for the launch. When he arrived a few hours before liftoff, the sky was clear except for some high clouds on the horizon. Unfortunately, by launch time, the layer of semi-opaque high clouds had moved in. 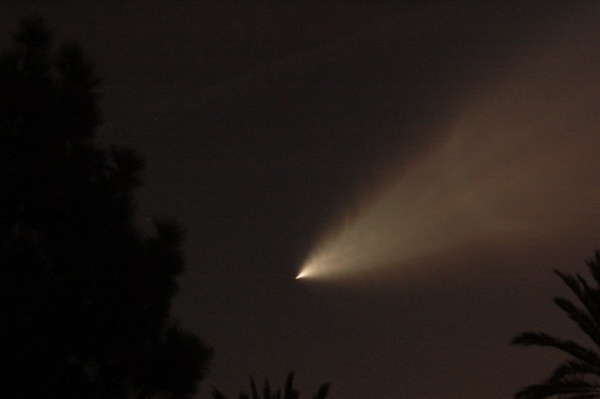 He was able to photograph the launch, but it was similar to taking photos through a sheet of waxed paper. The Minotaur's trail changes color as the vehicle climbs out of the Earth's shadow. The plume begins to expand. 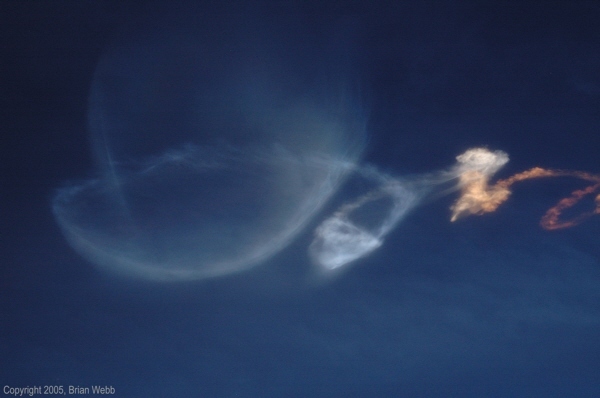 The dark line near the head of the plume appears to be an actual feature in the rocket exhaust and not an image artifact or part of the cloud cover. A large break, probably due to stage 1 and stage 2 separation, occurs in the rocket trail and the Minotaur continues to head downrange. 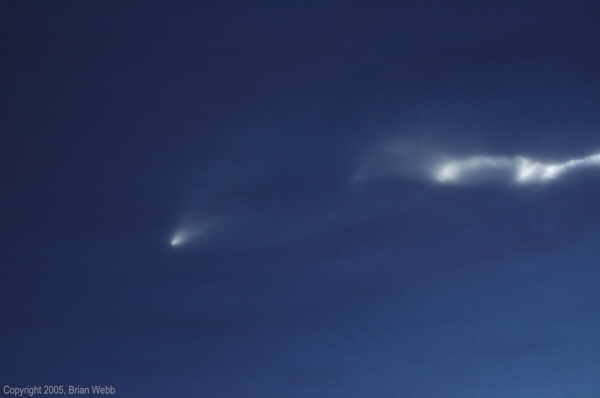 The rocket continues to head towards the south, producing a fan-shaped exhaust plume. Despite the less than ideal weather conditions, a hint of the plume's large size is visible through the clouds. 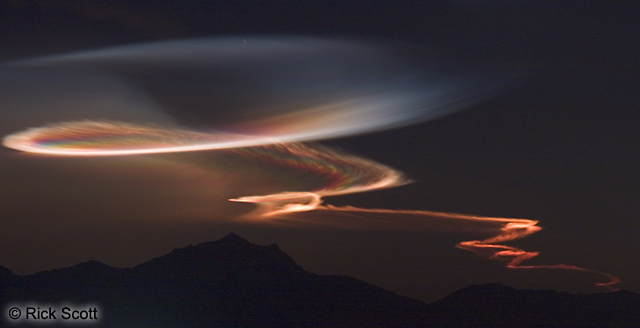 After the launch, the Minotaur's exhaust produced a colorful, twisted cloud high in the sky. UCLA's astronomy department operates a web camera atop Mount Wilson, some 5,700 feet above sea level. The web cam operator had advanced notice of the launch and recorded the following image. 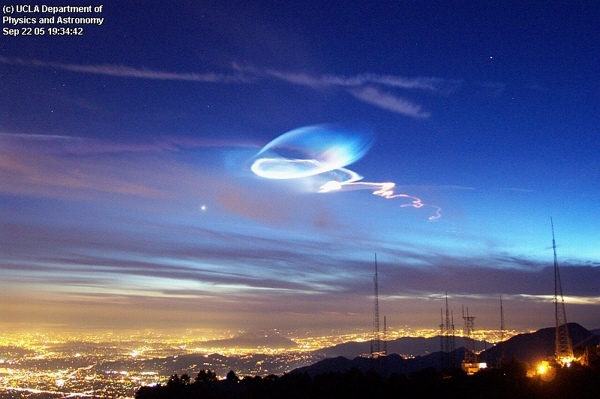 The Minotaur's launch trail hangs in the dusk sky above the city lights of the San Fernando Valley and adjoining areas. The bright star-like object left of center is Venus and the bright star in the upper right is Arcturus. The towers in the foreground are a few of the many TV broadcast station antennas that inhabit Mount Wilson (the tallest one on the right belongs to KNBC Channel 4). Optical engineer Dan Slater recorded the launch using his homemade, high-resolution optical system consisting of a 100mm aperture Maksutov telescope operating at f/30 and a monochrome video camera. The following image is a frame capture from his video. 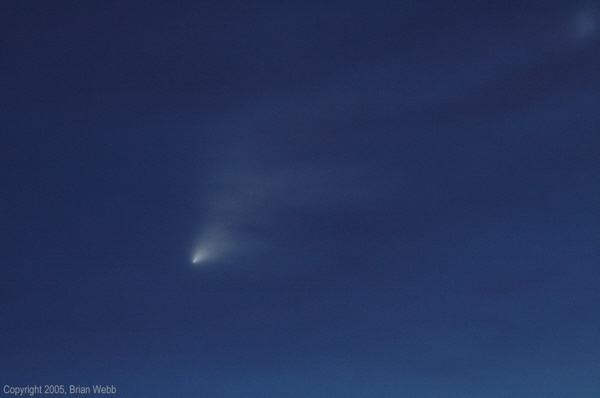 Dave Kodama recorded several images of the launch, two of which are reproduced here. Behyar Bakhshandeh did not know about the launch. He looked up during dinner and saw the rocket trail through the window. Mike O'Leary took several still photos of the launch from his backyard and used software to combined them to create this beautiful time-lapse movie. 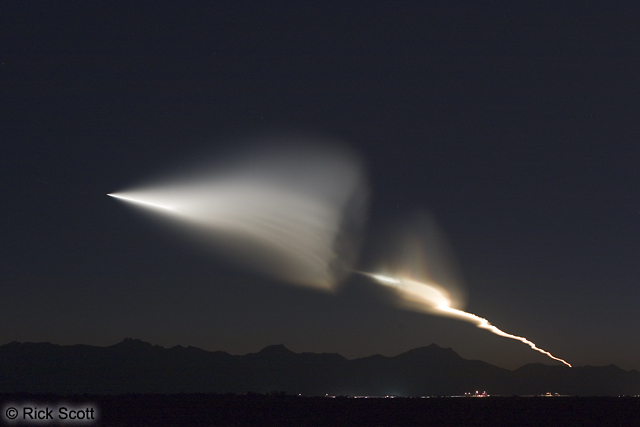 Dennis Mammana photographed the launch from Joshua Tree in California's southern desert. 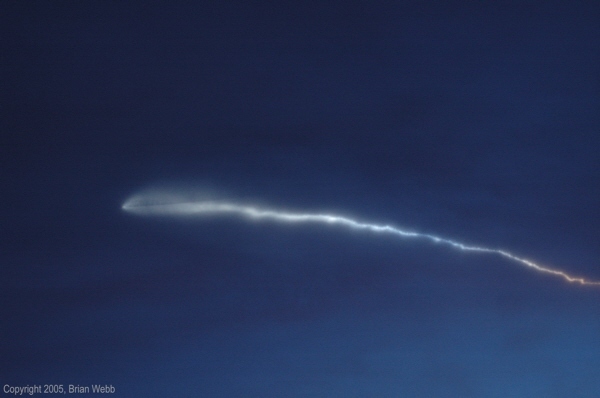 He was optimally situated for the event: far enough east to have a reasonably dark sky, but close enough to the rocket's ground track to get a very clear view of the detail within the exhaust plume. Mammana took this impressive image during the Minotaur's third stage burn. 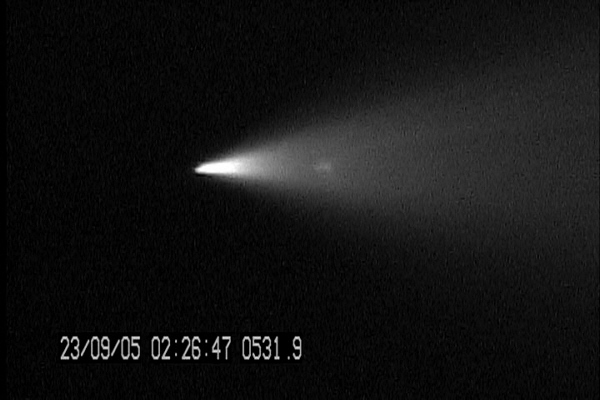 In addition to fine detail in the third stage plume (left), the image clearly shows the trail from the second stage (right) and the break in the trail from stage separation. 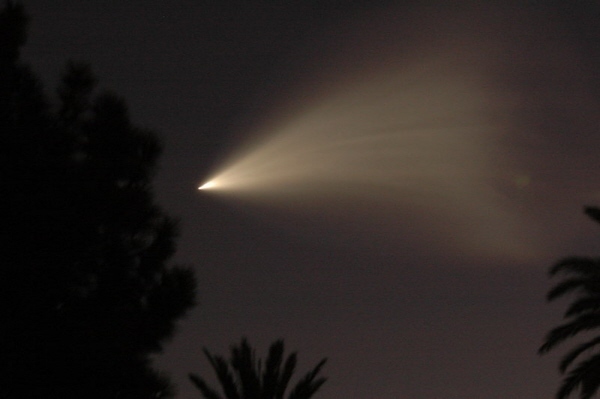 Rick Scott photographed the launch from Phoenix. 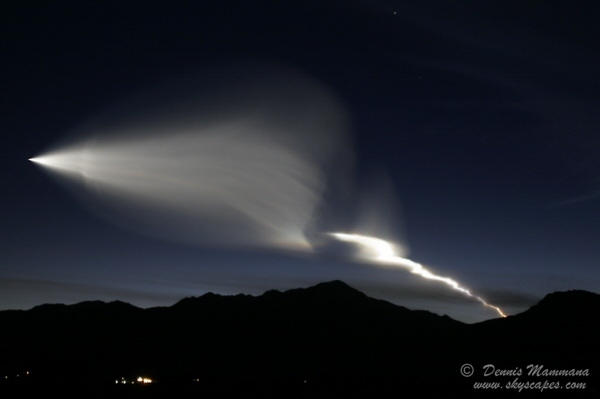 Although it was the first Vandenberg AFB rocket launch he had ever seen and did not know what to expect, he took some of the best photos of the event. Scott used a Canon EOS 20D digital camera, Canon EF 70-200mm f/2.8L lens, and Adobe Photoshop CS2 image processing software. This is an outstanding view of the Minotaur's exhaust plume. 8 second exposure at f/4, lens focal length 70mm. 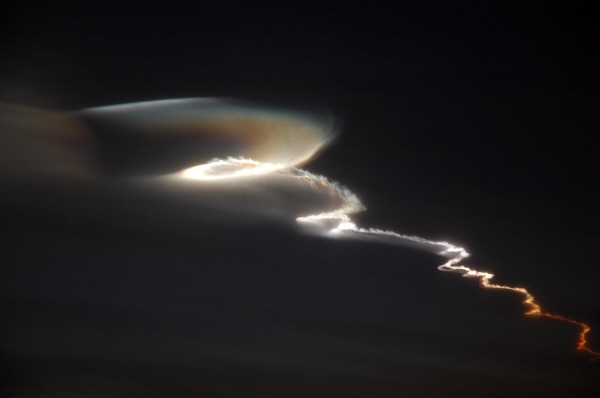 The rocket exhaust plume assumes a corkscrew shape and becomes a classic example of the Twilight Effect, exhibiting extensive detail and iridescence. 13 second exposure at f/4, lens focal length 170mm. 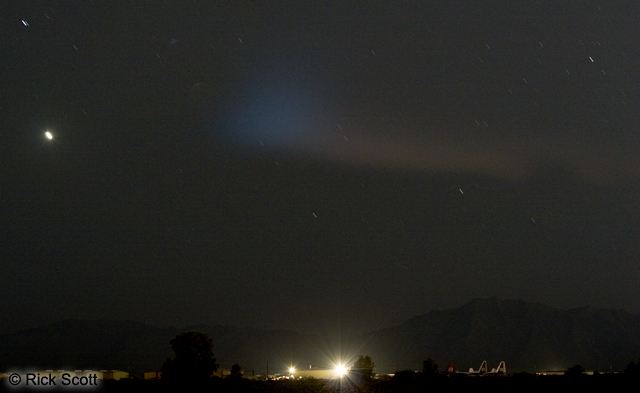 The last of the plume is visible as a slightly blue glow to the right of Venus, which is the very bright short streak near the left edge of the photograph. Exposure 30 seconds at f/4, lens focal length 70mm. Copyright © 2007-2016, Brian Webb. All rights reserved.